A milestone in the heritage of performance is now available for youth, with sizing that brings all the breakthroughs of a revolutionary design to young athletes who need the benefits of protection and an extended field of vision. Oakley innovation has reinvented the science of fit to create Sun and Prescription eyewear for youth faces. Youth today can now take advantage of Oakley’s decades of eyewear advances, including uncompromising protection and durability with the comfort of a specially-engineered fit. Analyzing aspects of facial geometry and frame architecture, Oakley’s Youth Collection blends optical performance with style to endure the daily activities of young active lives. Engineered for performance that would make a sport frame jealous, the Oakley Radar EV XS is a new version of a top performing sports style re-engineered for a youth fit. 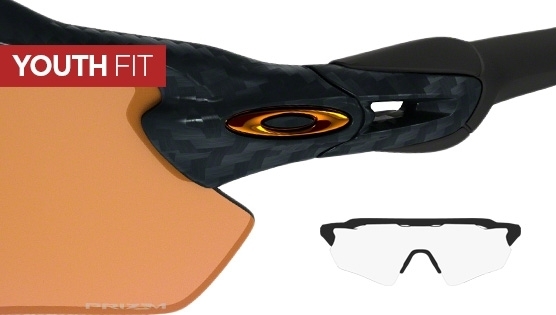 Created with performance in mind it hosts both hydrophobic and oleophobic properties to the plutonite lens to help prevent smudges all mounted on a lightweight frame made from Oakley's own O-Matter. Ideally suited to the small-medium sized youth face. Scratch resistant Plutonite lenses, the purest form of polycarbonate available, inherently blocks 100% UVA, UVB & UVC light. Optical clarity is top notch thanks to Oakley's HDO system which also boasts amazing impact resistance and visual fidelity.